Welcome to the VIP Junior Team, sponsored by e-tennis! (requires e-logo unless you have a signed contract with a manufacturer). The cost to participate is $100. All you need to do is to stop by the store and fill out the team member registration form. This team membership is personal and does not extend to siblings, parents etc. Each participating sibling needs to be registered to be able to take advantage of this program. Discount does not apply to clearance and sale items (in those cases, we apply the VIP Jr. Team discount to the original price and you pay whichever price is lower). e-tennis is locally owned by ex ATP player Tobias Svantesson (career high world ranking #89 in singles and #60 in doubles) and we have been serving the Central Florida area since 1999. Our goal has always been to provide the best value possible by providing the best products, best customer service, best technical knowledge, most consistent stringing, all at a fair price. 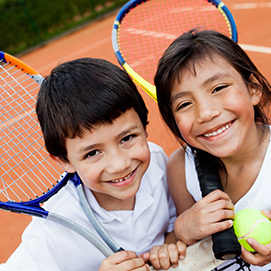 We are looking forwarding to partnering with you on your tennis journey.